’When we played on our travels ‘the name of the Redcliffe RSL and Municipal Band emblazoned on the lapels and hats of the players made us the greatest ambassadors for the City of Redcliffe’. K Cope – Band member. On July 25, 1961, a public meeting was held to form a new brass band in Redcliffe. This was the birth of the Redcliffe RSL and Municipal Band. The first president was William (Bill) Beston. The original band members, fifteen in all, were recruited by Bill and their initial practice took place on December 11, 1961, under the baton of Jack Ryder. The Ryder family was well known in the music field and Jack had taken many young players to success in solo and other competitions. The first secretary’s name is recorded as A Kelly. He transferred to Townville in 1962, but not before he had helped to establish the operations of the band. Neil Crittenden was elected to the position in the same year and remained as secretary until the late 1970s. Tom Toner became the second band master in 1967, after the death of Jack. Tom had moved from the Caboolture Brass Band to take up the position and continued until 1971; he was retained as deputy band master. Bert Williams, a notable cornet player, was Tom’s replacement and brought with him a depth of experience, having played with 4th Armoured Division of Queensland. He had been band master in Casino, NSW before he joined the Excelsior Concert Band in Brisbane. Holder of the Band Association Merit Award and a Life Member of this organisation, Bert had also played with the Queensland Concert Band under the baton of Colin Thomas. 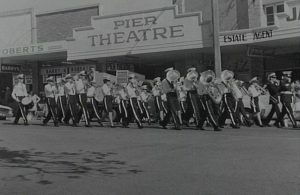 In 1965, the RSL and Municipal Band shifted its focus from its establishment as a new brass band in Redcliffe to the development of greater opportunities for the band’s members. While a band contest in Redcliffe would have been ideal, this was initially impossible due to financial considerations. Solo and party contests were chosen as a way to build the band’s profile. The party contest (for two or more players) was held on each Queen’s Birthday weekend in June. It proved to be one of the great successes of the band’s calendar year with players coming from all over Queensland including Brisbane, Toowoomba, Stanthorpe, Bundaberg, Maryborough, Nambour, Ipswich, the Gold Coast and many other centres. The band also travelled. It frequently participated in the Stanthorpe Apple and Grape Festival, a biannual event which brought together brass bands, Scottish bands, choirs and other entertainers from across Queensland and the other eastern states. Supported by local businesses, this festival attracted patrons from all over Australia, a real boost to the local economy. Gympie’s Gold Festival in October was also a regular destination for the band. The Redcliffe RSL and Municipal Band participated in band contests across the state where they played their concert pieces, hymn tunes and marches. Maryborough, Nambour, Beenleigh were just some of the centres where they appeared. For many years, the Redcliffe RSL and Municipal Band was a regular fixture in Redcliffe’s annual Anzac Day March. When the Band was first formed, the uniform was navy blue with a red stripe down the leg, a navy blue hat with a white top and a dark red tie. This was superseded by a green uniform with a gold stripe down the leg and a green hat trimmed with gold. In 1977 at a cost of $6000 a third uniform was introduced, styled on the Queensland Police tunics, this new green uniform contrasted with a white shirt, green tie, black shoes and to top it off, a green peaked cap. The original script can be found in the Redcliffe Library History Room. In 2016 and 2017 the Queensland Band Association State Titles was held in Redcliffe in the Redcliffe Cultural Centre.